Recently I had the idea of copying some old VHS cassettes that I have, into MPEG files on disk, and then upload them to Youtube. Simple enough, right? I did manage to get the transfer to MPEG files to work ok. It’s so much easier working with MPEG files than dealing with tapes. Interestingly enough, I’m told some companies still use tapes for backups. And I still wonder, why?? Disk is so cheap now, and has so many advantages. Would you ever transfer your MPEG files to VHS cassettes? Either allow me to manually select a clip, or split it up the file into sections automatically. Write the clip to mpeg file with no modifications to the mpeg such as resampling. If you think of a binder with hundreds of pages in them, I want to just grab a section of pages from the stack. Not recopy them. Or rewrite them. Or photocopy them. Or resize them. Not change the format. Naturally, you also want a video player to see the file both before and after the editing. You want to see exactly where your edit will be. The exact frame. Even VHS cassette players do this. Intuitive? Not too difficult a concept to grasp? Now, I don’t know much about video editing. But when you think of it, isn’t this one of the simplest things you do in video editing or in any software? If you were putting a video together from different sources, don’t you have to pare them down into smaller clips? Even when I work with Word documents, cut and paste is one of the most common tasks I do. I thought, I’ll just install free some software and be done in a jiffy. Yeah, right!!! I’ve since spent a good six hours struggling with a number of different software packages now, and I still have no file split into sections! Let me tell you about the surprise factor. The first surprise is finding some free software. I searched with a number of variations of “mpeg, split, youtube, free”, etc. I’d find some websites. But then I find out that there was a price to use it. For instance, a search for free gave me, Nero. But when I drill down, I find that it’s: Price: Free to try (15-day trial, some features disabled) $79.99 to buy. I’m only going to be doing this a few times, so I’m not interested in paying for it. But I expect this is going to take at least a few weeks, so these trial time periods are too short. The next surprise is to look at what they want to charge for what they give. AccuSplit v4.6 wants $15 USD. And the entire program is only 325 Kilobytes! Quick MPEG Splitter is 4.9 megabytes, and costs $19.95. Hey, maybe I’m in the wrong business. Zone Alarm is one of the few software packages that I pay for. $30 for three computers for a year. The main program is about 130 megabytes. Not only that, but it gives continual antivirus and antispyware updates every time I turn on my computer. I haven’t bothered to measure how big those AV files are, but I know that they are substantial enough. The next surprise factor is installation. The prerequisites are not stated anywhere. You only find out when you start installing. Such as, you need the latest .NET. Surprise! What if I didn’t want to install .NET on my machine because I needed to work with the old version? Another wanted to install the latest Windows Media Player. Another wanted my email address so they could spam me. Why are the pre requisites not stated before I download??? A number of programs did not have any screen shots on the web so that I could get a better idea if your program would work for me. Why not? It’s not that difficult. Some software actually installs spyware, etc. I expect that Zone Alarm caught it. Why are you building spyware? Why is your software doing things that it should be doing? Can’t you make a good enough product that’s’ more profitable than spyware? So much for finding and just downloading it. My real beef concerns why all these software packages are so bad. If I did manage to get the software installed, all of them had a serious enough flaw in one way or another. Some didn’t install at all. Others had a bad interface that was not obvious. Others just simply didn’t work from end to end. And others required a huge, no, make that massive, learning curve. These are some of the products. A number of the products that I started with, I didn’t take any notes on. But after a number didn’t work, I began to taking notes. These are some of the products that I struggled with. Try Avidemux 2.5.4. I spent a number of hours struggling with it on at least two days. It’s trying to be a full blown video editing software that can do all kinds of things. I suppose it’s attempting to be a competitor to Final Cut. So, you may say that it is too big for what I want to do. Much of the issue is that it expects a perfect video mpeg input, to make a perfect DVD output. And my video from the VHS was not the perfect input for it. Although the same MPEG files played on Windows Media Player, and Power DVD. Fussy is it? The other issue is that is does expect you to know or learn everything about video. All kinds of video and audio formats, codecs, and all their properties. And then, they want you to learn the strange interface to use the software. A serious flaw is that the error messages don’t help you. You have to go and research more, look up online documentation, or look for other people’s blogs to see their struggles. I spent a number of hours struggling with it. Maybe I’ll make a bigger review of it in another post. But really, why can’t such a big program, handle one of the simplest tasks in video editing??? Try Easy Video Splitter 2.01. Install the software, and go to test it. First it said that the MPG file was invalid. But the file was working fine, in Media Player, and my DVD player software. So why was it invalid? But the program still opened the file, so I pressed on, and hit the split button. Did seem to generate some files. But the files that were created, had only a second or two of content. This is not my paraphrasing. That is the actual error message! Well that’s informative, isn’t it. Also they only give a 7 day trial, then they want money. Even though it doesn’t work. To work with it, you have to make a “project”. It looks like it’s geared toward throwing a number of segments together, not splitting files up. Their philosophy seems to be, one product, to do one thing, and do it well. Not unlike Unix. Their Youtube download product works really well. The user interface is pretty simple, user obvious. This software is so simple, it has no Help, or About. Although the version is listed on the top title bar. But I think that they should have the usual Help, About menu. Unfortunately this product does the opposite of what I wanted. It cut a clip, and saved the remainder. I wanted to cut out a clip, and save the clip. I can do a workaround, but it will be a LOT more mouse clicks. Not only that, but I will have to note exactly where I make the cuts. Since I’m already familiar with the Youtube download product, and my time is being wasted, I try the workaround. It does make a file. But the MPEG file that it does create, only works in Power DVD. It doesn’t work in Windows Media player. With the resulting file, when I slid the slider forward in Windows Media Player, the previous image remains, and nothing happens. 😦 Go figure. They also made the product: FreeFastMpegCut.exe. But the version 2.4 that I had, didn’t work. Again, that file didn’t work in Windows Media Player. And I can’t find the latest incarnation of this product on their website, so it seems it is no longer supported. Online reviews and instructionals say that to do something so simple, it’s a LOT of manual cutting and pasting. Opening and closing projects. Many mouse clicks. Not interested. Look at MPEG Scissors. Screen shot looks good. But it was made in 1999! I have no interest in fighting with OS problems. Freesky video splitter 2.1 looks like it might work. But after 5 minutes of jerking around with broken links, give up. Even the official website is down. Install it. Very odd interface character, rather than mouse interface. I can’t figure it out without referring to instructions. Requires educating yourself. Not only that, no sound. Get popup error message. Looks like it’s a DOS program that also worked on Windows 3.1!! The software installs and comes up. Good start. But no GUI as to what you are saving, or playing. No clear markers for start and end. Or change in color. Format of the time loses a digit. In human terms, we always say: Three, zero nine (3:09). Not Three, nine (3:9). Time only goes to the second, not subsecond. “Play Selected” keeps going past the end of the select. Takes minutes just to save a file only 13 mb in size, and a few minutes in size. Why? I expect that it is doing a linear write from start to finish, recopying everything. Maybe resampling, etc. Figure that if I split a 2 hour file, gigs in size, into ten minute segments, how long will I be spending to write it to file? Each time. I’m not looking to have my time wasted in a geometric progression. Uninstall. Even though I’m already running Windows Media player 9, the install wants to install the Windows Media player 9 runtime files. Why? Decline, but the install continues. Why is the prerequisite for Windows Media Player not stated before I download???? It also won’t let me finish the install, or use the software without giving them an email address. Why? Go to use it, and save the cut. It plays the whole clip, as it writes. Why? Again, to split up a 2 hour video, you would need to spend at least 2 hours playing it to file! And then, the playback is VERY jerky. At least with Power DVD. Even the sound is off. Normally, the sound will be ok, but the video will be off. But interestingly, it works with Windows Media Player. It wanted to install the new version of Windows Media, and I said no. But it works with the old version of windows media, but not Power DVD. Crazy. It also puts “Chick Video Cutter” in the top left corner. See that it has options for the MPEG. Does it resample everything and I lose even more quality? No, I don’t want any resampling or transducing. Again, if you think of a binder with pages in them, I want to just grab a section from it, same everything. Not rewrite everything, or photocopy everything. I take pride that a lot of the systems that I have created, worked right out of the box. And never required maintenance. This is so in contrast with so many systems, or software packages that I work with. As I work with software more and more, I find that it seems to be getting worse and worse. Not only software, but operating systems too. And especially websites! You would think that over time, software would be getting better. Especially when there are tools with big libraries behind them now. But the software seems to be getting worse. Why? Why is something that is intuitively, so simple, so difficult, for so many companies or individuals? Why doesn’t the software install? Why doesn’t the software work? Why is the interface so difficult to figure out? Why does the simplest of tasks require an education? Didn’t that idea go out when DOS was retired? Why are the error messages not self explanatory? Why do I need to go google to figure out the solution? 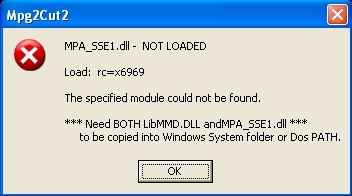 Why does the error message itself not give the solution? As for packages resampling as it writes to file. No, really, I just want to cut out the segment. I don’t want to resize it, resample it, reformat it, etc. And if your software is doing that, why is this not stated somewhere to inform me that such is happening? Misleading Reviews: I have to say that a lot of the reviews that I’ve read are pretty misleading. The editors makes a glowing review. But when I tried the software, I can’t even get the software to do the simplest thing. Why do the editors give such good reviews? Did they come from the same agencies that rated the toxic MBS securities as AAA? Free Trial With The Software: At least with the “free trial”, we can determine that the software is not going to work, or is crap, before we buy it. In the early days, we had to shell out and buy the software in a shrink wrapped box, before we had the chance to try it. And call the manufacturer to return it if it didn’t, because the store wouldn’t take it. My time has been seriously wasted in this process. Because the software is such crap. I really hate that. I’m not getting paid for this. Yes, the software is free. I guess I’m getting what I paid for. But why bother making such crap software in the first place? Do you really think that someone will pay for it? Or, if it’s free, do you really want to put your name to it? If this is just a part time venture after work, is your quality the same where you work? In the time I’ve struggled, I could have just gone back to the VCR, and cut a number of ten minute segments manually. Yes, I do expect your software to work. Don’t you? I expect it to be not just easy to use, but obvious to use. The simple business needs to be, simple. Not complex. I expect you to do the testing and bullet proofing before you release it. When you think of it, why am I the one testing your garbage software? I’m not getting paid for it. Computers and software are supposed to make our work easier and faster. What a concept! Not longer, more complex, slower, and less productive. Computers and software are supposed to serve us. Not the other way around. As a practical question, does anyone know of a software that will do what I’m looking for right out of the box? This entry was posted on Saturday, November 6th, 2010 at 11:07 pm and is filed under Quality, Reviews. You can follow any responses to this entry through the RSS 2.0 feed. You can leave a response, or trackback from your own site. 4 Responses to Why Is Your Software Such Crap??!!! Daft question, but did you try the MovieMaker that comes with Windows XP/Vista (not the Live Movie Maker for Windows 7). We used it for pulling our home movies off (tape based) camcorder. It isn’t particularly good at building a DVD out of stuff, but it was pretty good at cutting. Video stuff is a bit of a mess though. MPEG is a container format. That actual video inside can be any one of a number of codecs, all with their own interpreters. Depending on where those codecs are and how ‘visible’ they are in Windows, some stuff works with some codecs, not with others. Marvelous rant! Thank you for sharing it with me. I really hate to say it, because Apple products, testing in Apple products, and rendering product for Apple products is the bane of my present existence. That said, iMovie is by FAR the best video editing program I’ve ever used. I don’t know if it helps with Windows XP, but I’ve heard that people have had reasonable results installing it in virtual machine software. I’ve never tried to do that, but if I had a serious video editing project coming up, that would be the first thing I would try. Apologies for the shortness of this comment. I wish I had the time to write something more thoughtful. I just can’t resist some of these questions. Hope you don’t mind. Video editing is not an easy thing to do. There’s more bad than good. Flash used to be a competent video editor, but recent versions of it have lost me. For years I’ve been saying that I can teach anyone how to program in an object oriented programming language, suffice it to say, any object oriented programming language, but after you spend that time doing it, you might not even understand the mechanics of what you’re doing for years. I’ve seriously seen it happen. Depends on the software. Most of the time because it’s written in sweat shops by indentured servants in far away foreign lands. Not exactly the best of conditions for anything useful, if you asked me. I’ve wondered the same thing. When I write a piece of code, or a piece of code comes through my office, I’m legally responsible and contractually bound to make sure that it runs to the best of my ability. Nearest I can figure in addition to this whole business of slave labor in far off countries is that a lot of these projects are created by grad students who haven’t learned how to test and debug yet. Everyone wants to be Bill Gates, or That guy from Facebook, but very few… surprisingly few have the skill and determination it takes to finish anything on their own. I hire grad students all the time. Trust me on this. 2. It’s a project that was commissioned by someone indecisive. The person who wanted the project done, apparently had no idea what he wanted to start with, and some poor development company in some country took the job without a clear and concise contract. The requirements shifted to often, which caused the programmers and interface designers to come up with something that’s bulky. Of course, the guy who commissioned the software is happy now, and he paid his bill, so everyone’s happy. As to whether or not he’ll ever sell one… that’s another issue. 3. Now, I’ve seen a lot of things in my 15 years in the field, and while I haven’t seen it yet, I’m convinced that someone is literally hiring monkeys to write code. Kind of like that book awhile back where the guy had a million monkeys running a newspaper in the 60’s. Why does the simplest of tasks require an education? Because the market for this niche has yet to be conquered. It will be. Probably soon. Didn’t that idea go out when DOS was retired? Oh, and to touch on your point about web pages. Everything is in flux right now on the web. This happens every few years. But right now, with the recent death of IE 6, web developers are no longer being held to write code for a 13 year old web browser anymore, and some of them (myself included) are feeling drunk with power over the whole situation. Sorry I missed the last question there. Google is your friend. As a follow up, here are some of the software programs I found that do their job well enough to recommend. – Good to work with MPEG files. – Good to work with AVI files. – good to find out info of your picture files. – good to find out info of your video files.